Sidney Bechet will be forever be remembered as the musician who brought to the attention of the jazz public the use of the soprano saxophone in jazz, prior to this he was a fine clarinet player in the New Orleans style. Sidney Bechet toured Europe extensively prior to making France his permanent home in 1951 and continued to live there until his demise in 1959. He still made a number of tours and recordings in America in the preceding years. These recordings were made either just before or just after his decision to make France his permanent home where he was treated with great reverence by the French people. The recordings are split between studio sessions and live concerts and therefore the recording quality differs from track but all are fairly acceptable. On all the tracks he is accompanied by the Claude Luter Orchestra, Claude Luter is a French clarinet player who worked with Bechet many times during his periods in France and makes a perfect foil for the American. Half the tracks at least were composed by Bechet and the rest were either Traditional or by other leading musicians. After a brief conversation in French Bechet launches into a majestic version of Jelly Roll Morton’s “The Buddy Bolden” which demonstrates why he was much admired. Bechet’s own “Francis Blues” is another fine outing on soprano. A Bechet recording without the obligatory version of “Petite Fleur” was recorded live at the Salle Pleyel in Paris and some nice trumpet obbligato by one of the players in the band. 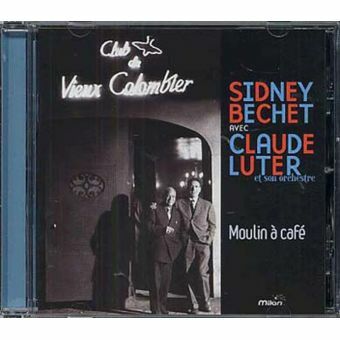 This is a good example of Sidney Bechet’s later work and will appeal to lovers of this type of jazz and others new to the music. For buyers who do not read French the notes in the booklet will be incompressible.